What do Charles Bukowski, Joyce Carol Oates, and Edgar Allan Poe have in common? They love cats. Writers and cats go together like salt and pepper, and here are 16 of our favorite pairs. "One cat just leads to another." "Having a bunch of cats around is good. If you're feeling bad, you just look at the cats, you'll feel better, because they know that everything is, just as it is. There's nothing to get excited about. They just know. They're saviors. The more cats you have, the longer you live. If you have a hundred cats, you'll live ten times longer than if you have ten. Someday this will be discovered, and people will have a thousand cats and live forever. It's truly ridiculous." "I write so much because my cat sits on my lap. She purrs so I don't want to get up. She's so much more calming than my husband." "'No,' said the cat. 'Now, you people have names. That's because you don't know who you are. We know who we are, so we don't need names.'" "'Name the different kinds of people,' said Miss Lupescu. 'Now.' Bod thought for a moment. 'The living,' he said. 'Er. The dead.' He stopped. Then, '... Cats?' he offered, uncertainly." —Allen Ginsberg, "I learned a world from each"
"That's the great secret of creativity. You treat ideas like cats: you make them follow you." "If a fish is the movement of water embodied, given shape, then cat is a diagram and pattern of subtle air." 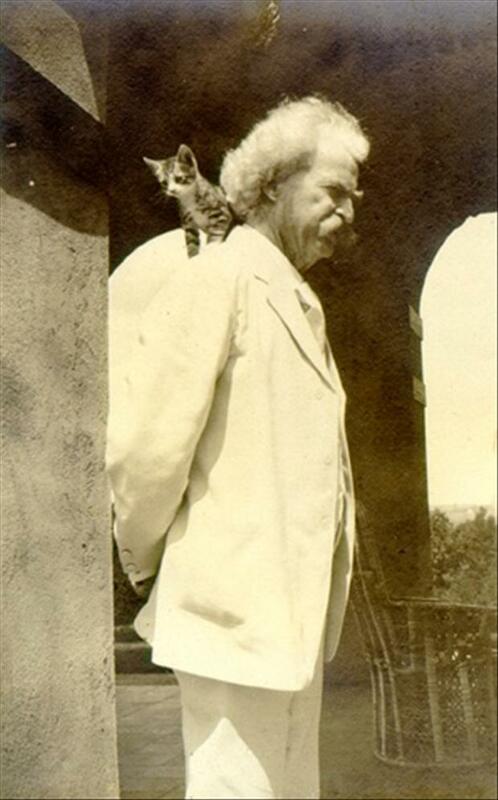 "When a man loves cats, I am his friend and comrade, without further introduction." —Mark Twain, Who Is Mark Twain? "And I a smiling woman. And like the cat I have nine times to die." "'My young friend,' I said, 'if you want to be a psychological novelist and write about human beings, the best thing you can do is to keep a pair of cats.'" "The cat does not offer services. The cat offers itself." "My relationship with cats has saved me from a deadly, pervasive ignorance." "How absurd these words are, such as beast and beast of prey. One should not speak of animals in that way." "When a Cat adopts you there is nothing to be done about it except to put up with it and wait until the wind changes." "Willis, my tomcat, strides silently over the pages of that book, being important as he is, with his long golden twitching tail. Make them understand, he says to me, that animals are really that important right now. He says this, and then eats up all the food we had been warming for our baby. Some cats are far too pushy. The next thing he'll want to do is write SF novels. I hope he does. None of them will sell." of a place bounded like a dream." —Jorge Luis Borges, "To a Cat"